The Philadelphia area was spared the big storms that other parts of the country have dealt with this week, but the dark injury cloud that has been lingering above the Phillies was sure to rain on some more heads. Right-handed starting pitcher Joe Blanton has been placed on the disabled list with an impingement in the medial side of the elbow on his throwing arm. The fifth starter, Blanton, has a 0-1 record with a 5.92 ERA through 4 starts this season. Blanton's turn in the Phillies' rotation on Friday will be taken by 23-year-old Vance Worley, who has posted a 2-2 record with a 2.78 ERA and a 25 strike outs in 22 2/3 innings in 4 starts with Triple A Lehigh Valley this season. 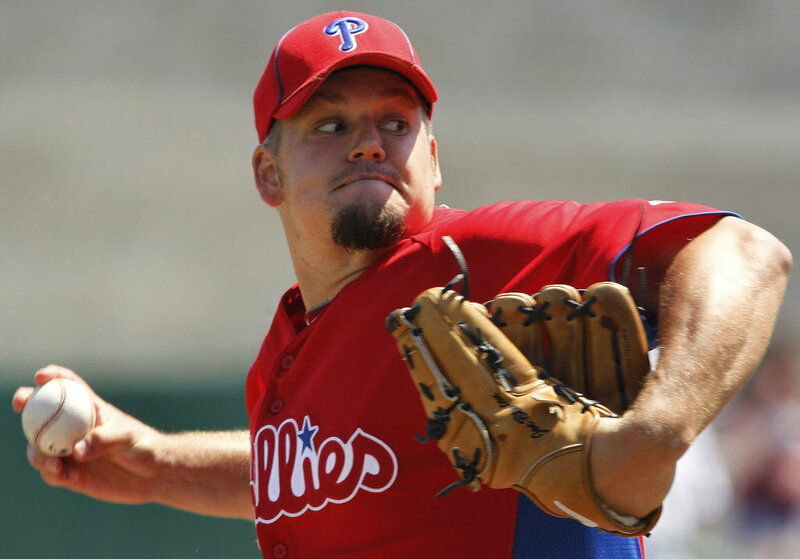 Worley, a 3rd round draft pick in the 2008 draft, made his Major League debut with the Phillies last July, and went 1-1 with a 1.38 ERA in 5 appearances with the big club. In addition, word out of Lehigh Valley on Thursday night was that catcher Dane Sardinha had been dispatched to Philadelphia. Phillies starting catcher Carlos Ruiz left Wednesday's game in Arizona early with a back ailment. While initial reports stated that Ruiz would not need to be placed on the disabled list, Sardinha's movement is clearly happening in case Ruiz must miss some time. Sardinha, a righty batter, has posted a .105 batting average with no homers and no RBI in 12 games played this season with the IronPigs. His counterpart Erik Kratz is batting .370 with 3 HR and 6 RBI through 10 games. Both backstops worked with Philies pitchers this year in spring training, but Sardinha worked with the staff last year as well, which gave him the advantage. Blanton and Ruiz would be joining the likes of Chase Utley, Domonic Brown, Jose Contreras, JC Romero and Brad Lidge on the Phillies' disabled list.